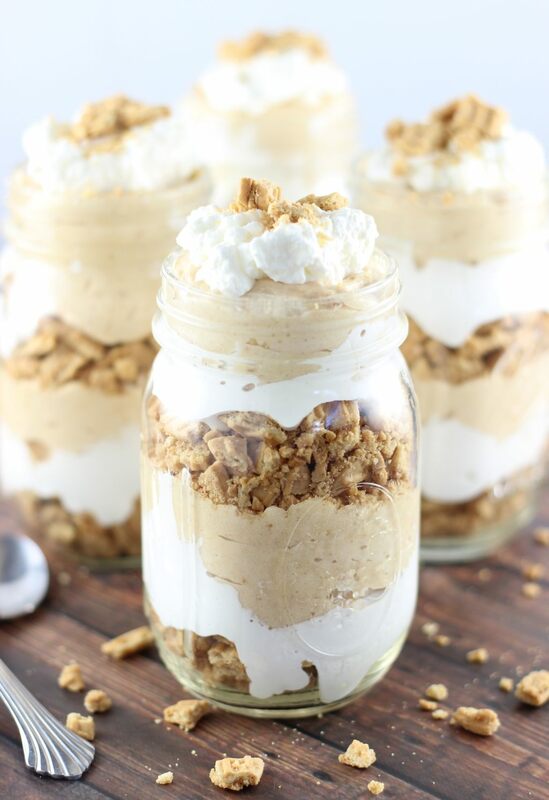 These quick and easy no-bake Fluffernutter Parfaits feature layers of peanut butter sandwich cookies, marshmallow cream, and a rich and delicious peanut butter mousse! Important life question: what kind of peanut butter person are you? Are you like me and you’ll eat any and all formats of peanut butter, whether creamy or crunchy? Or are you strictly a creamy peanut butter person, like my Grandma? Or are you like my mother who will only eat crunchy? I don’t discriminate, but I know that sometimes people have a personal preference about texture, and opt for one over the other. Unless this is your very first time visiting here, you guys know how much I adore the nutty stuff. 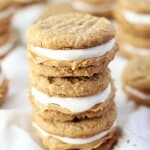 I don’t have that many categories of recipes on this blog, but peanut butter has its own dedicated archive. I have that many recipes featuring my favorite food of life. Seriously, it’s my favorite food of life, and the only food I’d take on a desert island with me. 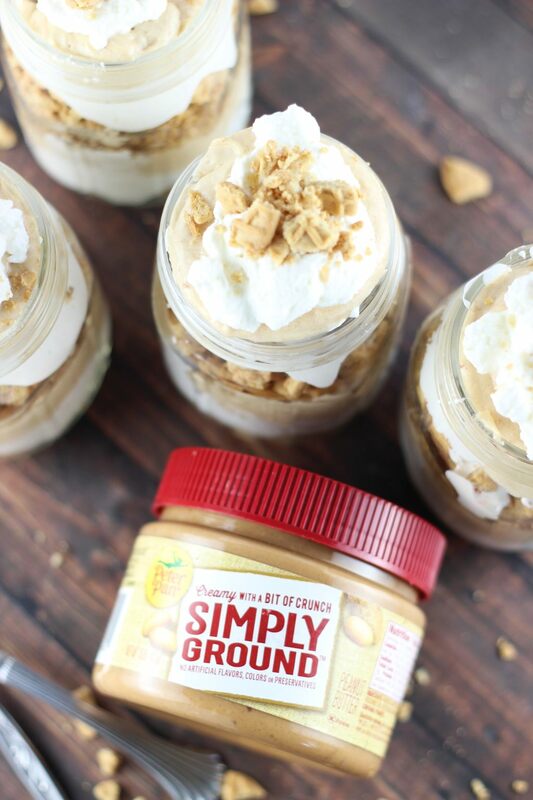 When I found this Peter Pan® Simply Ground Peanut Butter Original, I was intrigued by the texture, described as “creamy with a bit of crunch,” and I wanted to give it a whirl. Well, I love it. It’s just as it sounds – mostly creamy, but has a bit of crunch too. The peanuts are just a little more ground. It makes it easier to spread, which I enjoy, and it doesn’t need to be stirred, which is also convenient. It will sound cliche, but you really get the best of both worlds in this peanut butter. 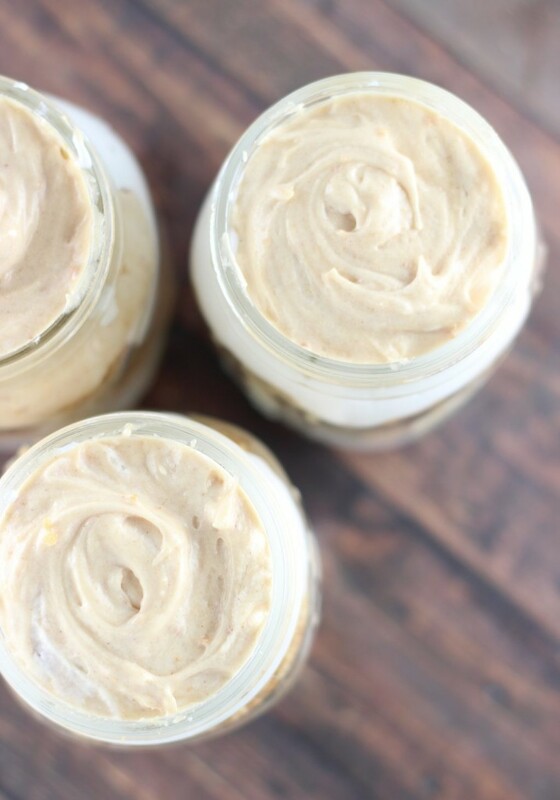 I wanted to create a recipe that would highlight the unique texture of this peanut butter, without masking it’s delightful hybrid of creamy-crunchy. The first idea that came to mind was peanut butter mousse. Perfect! 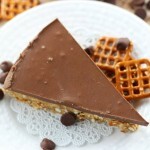 The bit of crunch will still shine through a creamy mousse. But I always think that puddings and mousses are that much better when they are part of something else, and that ‘something else’ is these Fluffernutter Parfaits. 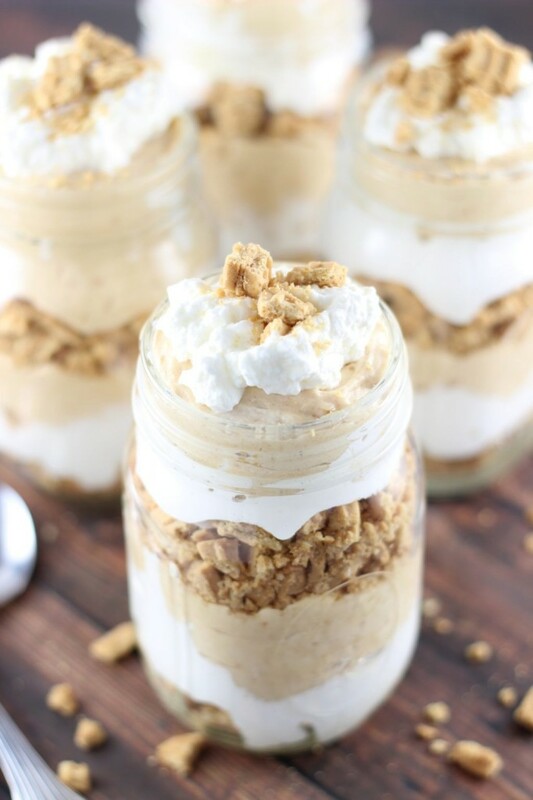 With layers of crushed peanut butter sandwich cookies, marshmallow creme, and a homemade peanut butter mousse, these no-bake Fluffernutter Parfaits are quick and easy to assemble, and are loaded with flavor and texture! 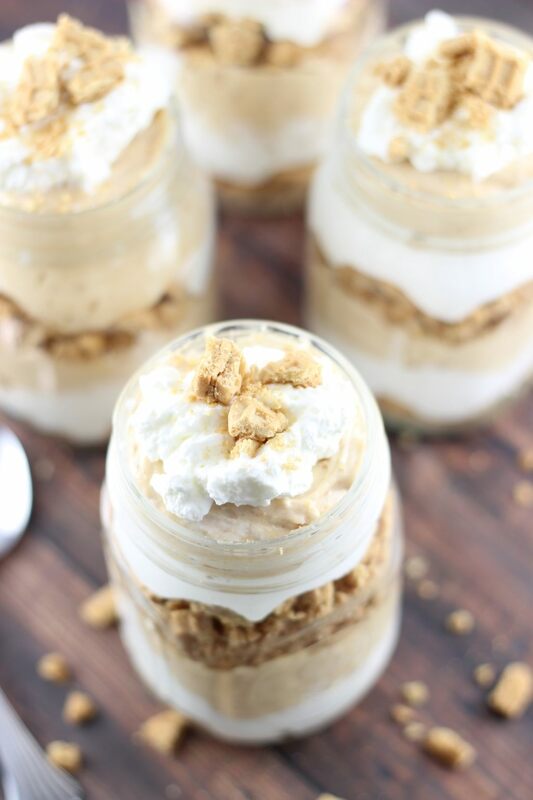 Parfaits with layers of peanut butter sandwich cookies, marshmallow cream, and a rich peanut butter mousse! 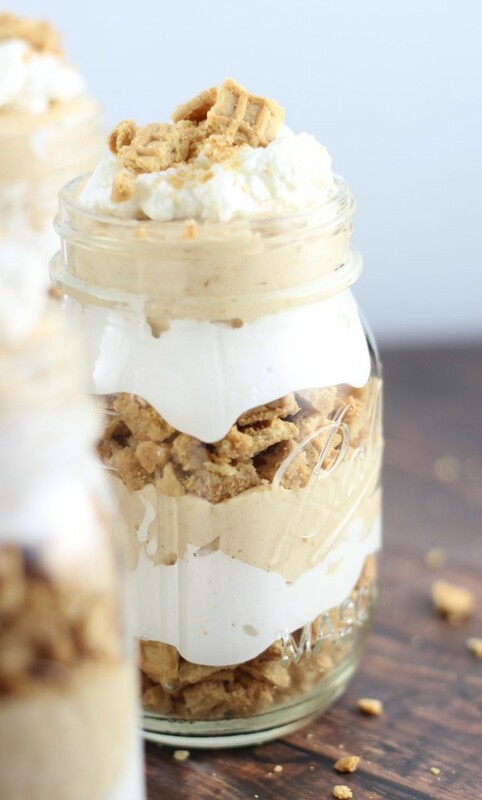 Add peanut butter, powdered sugar, and 1 1/2 containers whipped topping (reserve half of one container for topping the parfaits - this does not have to be precisely measured). In 4 parfait dishes or large jam jars, layer 2-3 tbsp. of crushed cookie in the bottom of each, top with a heaping tablespoon of marshmallow creme, followed by about 1/3 c. peanut butter mousse. Repeat the layers a second time, and then top with a dollop of whipped cream, and a few cookie crumbs. Store in the refrigerator. Enjoy! 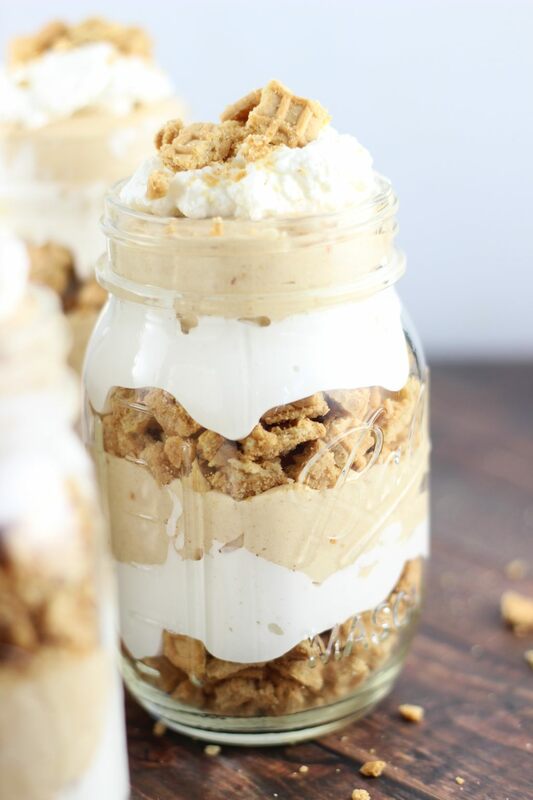 The marshmallow creme layer can get a little messy, but it helped to drop a dollop into the jar, then use a very small spatula or the back of a spoon, sprayed with non-stick spray, to spread it around. It won't stick to it because of the non-stick spray, so it is easier to spread. These parfaits look totally delicious! These are definitely calling my name! Love those layers. Seriously. EVERYTHING about these parfaits sounds pretty perfect, and I can’t wait to get my hands on these ingredients because, well, flutternutter. Mmm. So good. Like you, I’m happy to eat any kind of peanut butter. 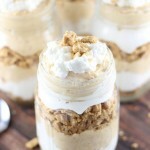 And I have a feeling these parfaits would disappear at an alarming rate in our home! Oh my word, these look SO delicious!!! 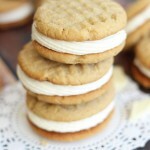 Seriously need to make these ASAP! Wow girl again you amaze me with your yummies! 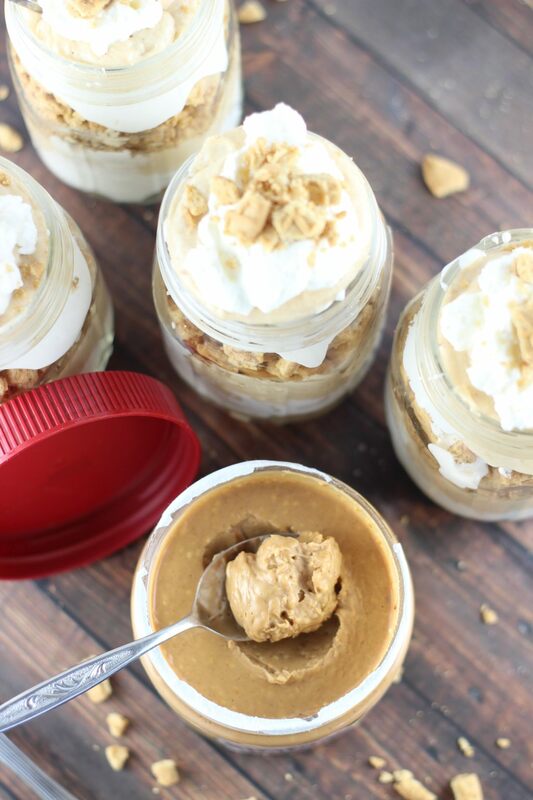 I am such a creamy peanut butter gal but this looks fantastic! These look awesome Sarah! Need to try this peanut butter! Pinning! Thanks, Mira! You do need to try it – I love the texture. It’s really different and delicious! Here in California Fluffernutters are not as big as they are on the East Coast. But this looks scrumptious! 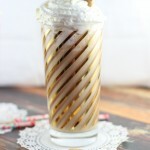 Thanks for sharing on the Creative K Kids Tasty Tuesdays Link Party. I hope you will join us next week. Oh how funny. I had no idea they were sort of regional! 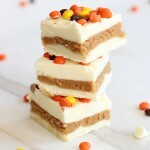 I love any peanut butter dessert, and it’s always a win when marshmallow is involved! Haha! I am like you, I will eat my peanut butter anyway! The stuff is amazing! And I love peanut butter deserts. I can’t wait to try these. These look sooo yummy! They look super cute served in the mason jars too. Love your pictures. Thanks for sharing at the #HomeMattersParty – hope to see you again this weekend. This looks absolutely to die for. YUM is the only word I have to say for it. The phrase on the other hand is get in my belly, now. I need to make this! Thank you for sharing with us at #ThrowbackThursday, hope to see you again this week! Congratulations on your feature on the #HomeMattersParty! Haha! It’s funny how some people have a clear preference, right? I really like this PB. It really is like the best of both worlds! I love peanut butter, this looks yummy! Thanks for linking up to Home Matters Party.